party games – What's Cookin' @ Special Collections?! Holiday Entertaining, Part 0.5 of 2.5: Trivia Time Answers! Mental Cocktails, 1933. Answers to Test #2. Mental Cocktails, 1933. Answers to Test #6. Here’s hoping you all got a perfect score! And more importantly, we here at Special Collections hope you have had wonderful holidays you may have already celebrated wonderful holidays just ahead! The university, which, of course, includes the libraries and Special Collections, will be closed for about nine days starting on Thursday. But, just in case you can’t go without your History of Food and Drink Collection fix, there will still be a feature post next week! It’s all written and scheduled to go out. No card games or trivia, but it *might* contain a few recipes for some sweet treats to share on New Years’ Eve…. Holiday Entertaining, Part 2 of 2.5: Trivia Time! Maybe card games aren’t your thing. Maybe you thought you had a handle on entertainment. Or maybe you just have unexpected company. Whatever the case, Part 2 of our holiday entertaining series is here to help. This week, it’s trivia. 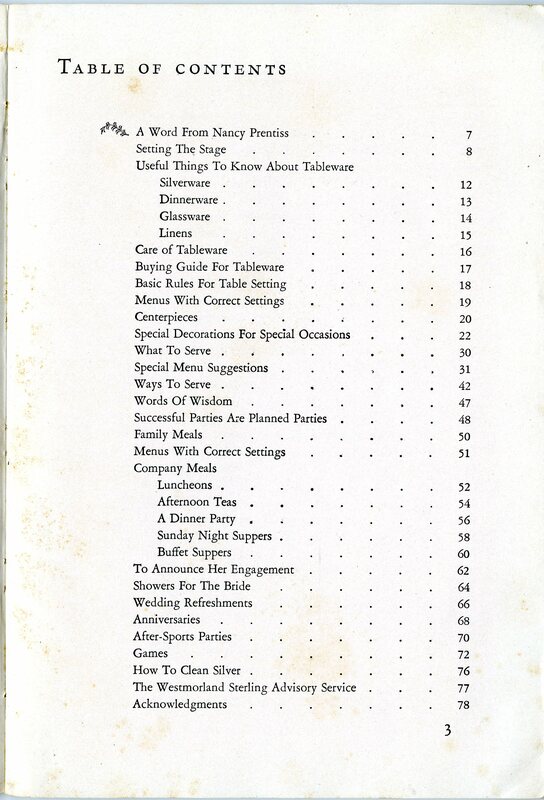 Well, our feature publication calls them “tests,” but Mental Cocktails, published in 1933, is really sets of trivia questions. Mental Cocktails, 1933. Test #2 Page 1. Mental Cocktails, 1933. Test #2 Page 2. Mental Cocktails, 1933. Test #6, Page 1. Mental Cocktails, 1933. Test #6, Page 2. On a side note, the book says that this is the first series and more volumes were expected. 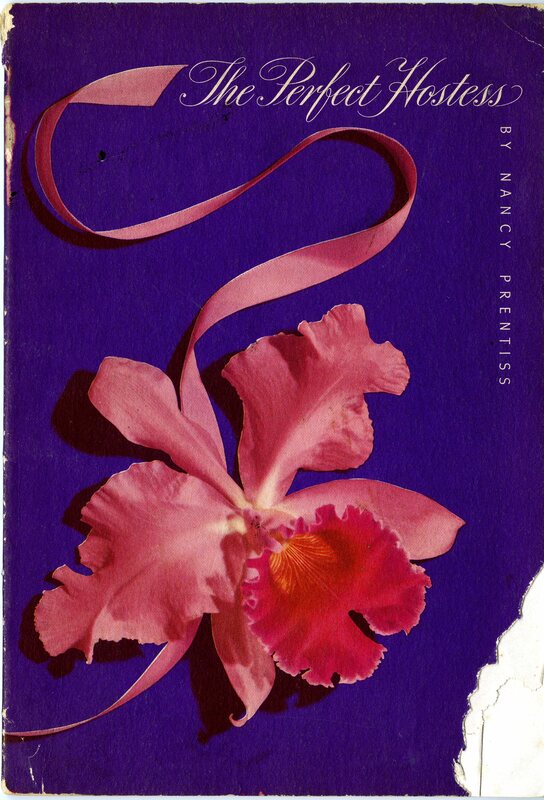 Our copy of this book is the only one I found cataloged in public or academic library hands and I wasn’t able to locate any additional volumes in the series. Part of that could stem from the lack of publisher and publication location information, but it leaves us with the trivia question that isn’t answered in the back: Were there more Mental Cocktails or not?!? The holiday season is in full swing and I thought it might be a good idea to talk about entertaining. Many of us will be hosting guests or be hosted by someone else and there can With part of my family, we usually hit a point where some sort of game comes out. When I was younger, I remember learning lots of card games, most of which I couldn’t tell you the rules to now. In the last few years, it’s been word games: Scrabble, Bananagrams, and, for a short time, Master Boggle. (I say “for a short time” on that last one, since after a few rounds with your favorite culinary blogger who happens to have an English/Literature background, some family members won’t play with me anymore.) But that’s neither here nor there. 🙂 If YOU are entertaining, or looking to be entertained in the next few weeks, I’ve got a 2.5 part series of blog posts for you! This week, it’s How to Entertain with Cards! This lovely little booklet covers card parties for formal clubs, special events, and the everyday. There is information on creating and managing a club, foods to serve, game to play, and even how to send invitations. Everything a person could need to keep the guests busy! How to Entertain with Cards, 1921. Table of contents, page 1. How to Entertain with Cards, 1921. December parties. How to Entertain with Cards, 1921. January parties. With 43 pages of information, there is plenty of be learned and put to good use, but for this week, I’ve focused on the relevant details for this time of year. 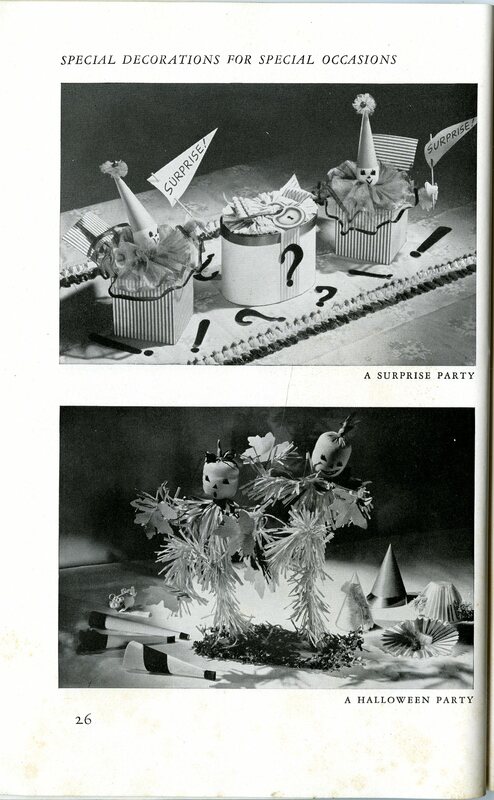 The booklet gets a little more obscure with suggestions for October Nut parties, Rose parties, and Seashore parties. 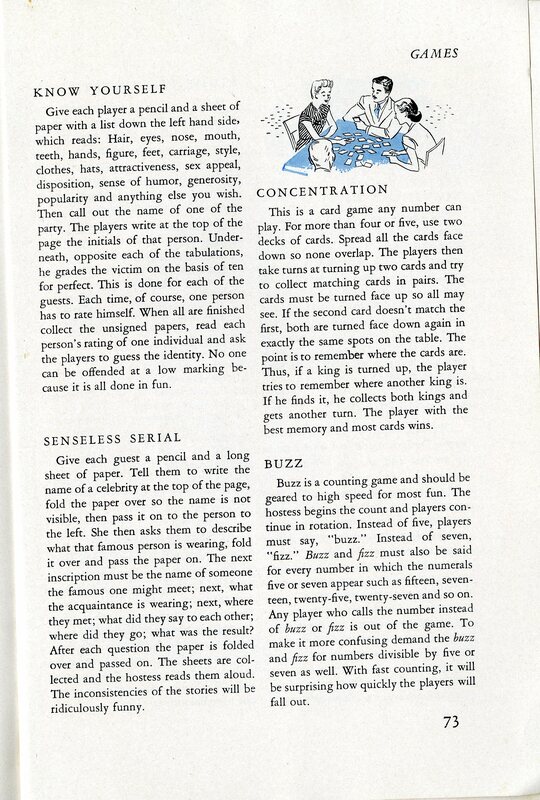 Oh, and in case you haven’t guessed–we certainly talk about advertising and motivation enough on the blog–this booklet was published courtesy of the U. S. Playing Card Company. This publication, and the one we’ll look at next week (for those really last minute trivia games), are both part of the History Food and Drink Collection AND the Cocktail History Collection. Why? Because the idea of the cocktail party as it evolved in the 20th century was about much more than just a cocktail. It was about drinking, true, but also eating, socializing, and sharing good times. 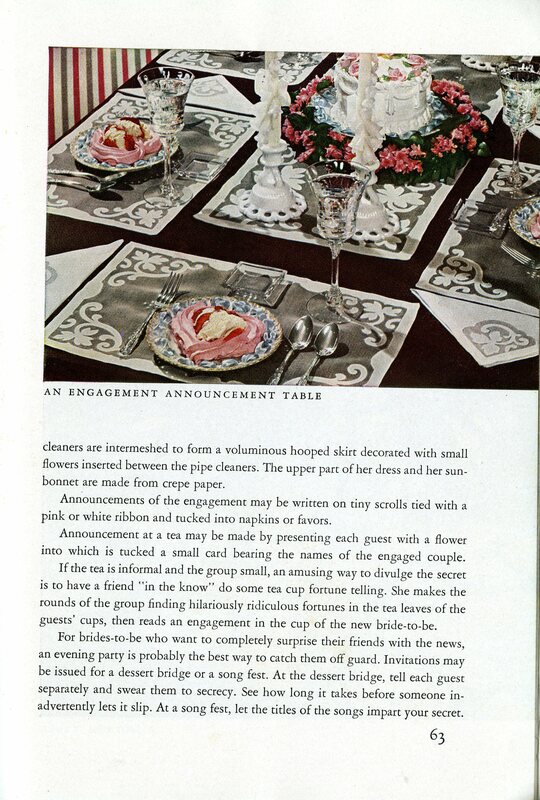 There is a great deal of social history tied to cocktails, dining, and entertaining visitors and How to Entertain with Cards gives us a little insight. 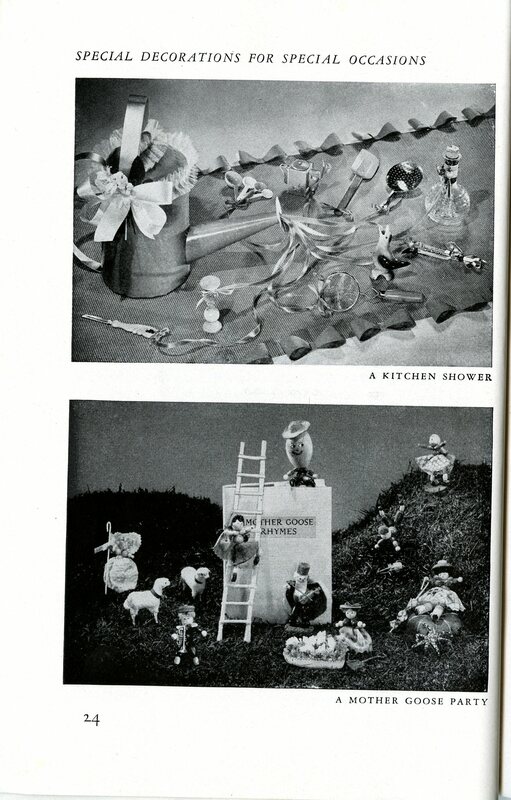 Food & Fun for Daughter and Son was published in 1946. We acquired a copy last year, but it slipped off my radar until recently. I must not have had the time to take a good look, or I undoubtedly would have shared it sooner! “To limited degree and in a kind, friendly way, table manners should be taught at an early age to avoid embarrassment when he comes in contact with older, well-behaved children. There are a few more pieces of advice about the kitchen, then it jumps to advice for caring for a child with a cold. I see the general connection, but the first couple chapters are a conglomerate of advice on a range of subjects that contribute to raising healthy children. We’ve definitely looked at books for/about children that featured party themes and planning, but I think this is the first time we’ve come across a book with section devoted to “Diversions for an Only or Lonely Child.” The suggestions themselves may seem outdated or silly, but it was neat to see the topic addressed in conjunction with entertaining kids who are sick or stuck in bed. So, until next week, if you’re missing us, don’t worry! There’s an imaginary pony of your own that needs training! If you’re New Year’s Eve festivities are lacking this evening, we offer our last post of 2014: More Fun at Cocktail Time. Published in 1935, it includes drink recipes, party games, magic tricks, and even a few canape recipes. Happy New Year and we’ll see you in 2014! Parties are for Kids, too! With the holidays upon us, it’s important not to neglect the kids! 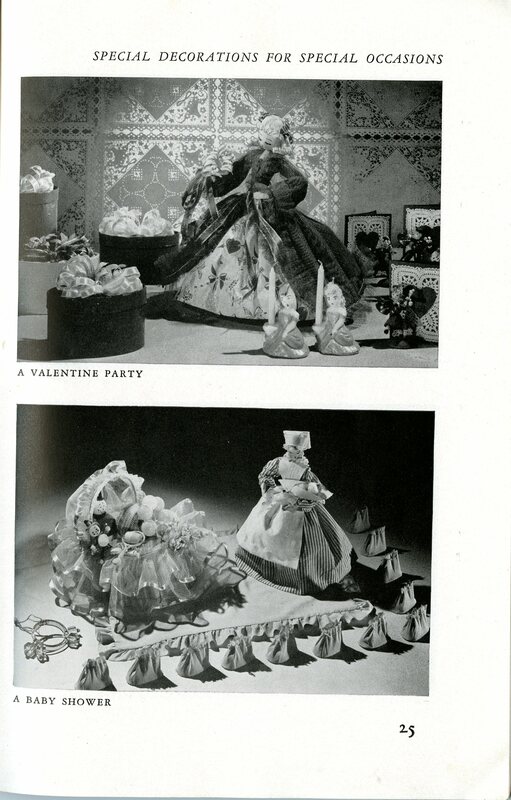 So this week, we’re sharing the Children’s Party Book from 1935. It includes games, decor, recipes, menus, and activities for kids parties. It not only covers major holidays (Valentine’s Day, Halloween, St. Patrick’s Day, Thanksgiving, Christmas, Easter, 4th of July, and New Years), but birthday parties and “just because” events, too. Surprisingly few of the games are really outdated, though some would need updating. The “States Game,” which requires children to write down the names of all the states may be a bit more challenging in 2013 than in 1935. But many of the word and puzzle games are still the same. 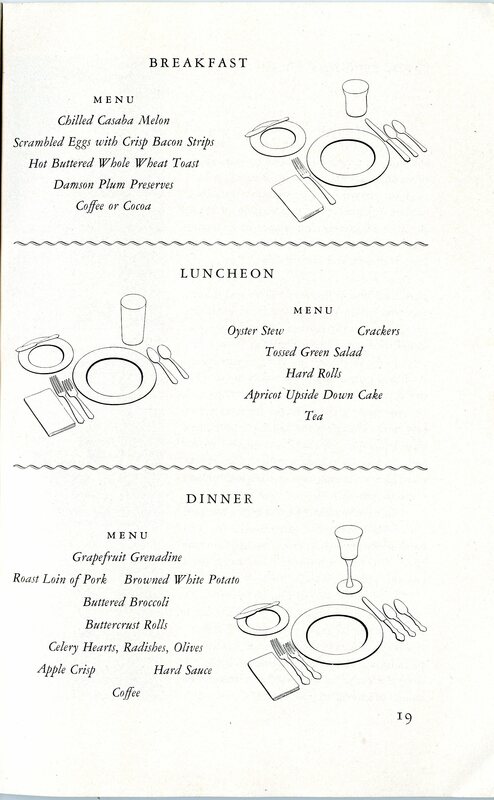 The Childrens’ Party Book was produced by the A. E. Staley Company, so you will find a few “sponsor” elements to it. There’s an introduction and a post script by company people and many (but not all) of the recipes are based on Staley products, but the advertising isn’t as invasive as some publications we’ve seen on the blog before. The focus really does seem to be on keeping kids (and adults!) occupied. Over the next two weeks, Special Collections may be closed, but we won’t leave you without a couple of holiday surprises. Just be sure to enjoy the rest of 2013! 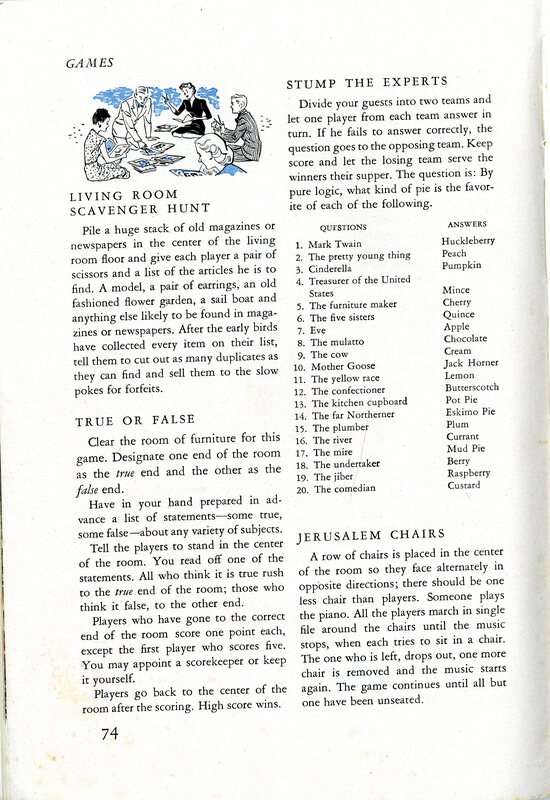 With all the variety, I did chose to scan two specific types of pages: table decorations and settings and party games. Right: Few fruits chosen for their color relationship. Wrong: Too much fruit, too great a variety…Right: At least four candles tall enough to be out of the line of vision. Wrong: Only two candles, burned down so they shine in the guests’ eyes. As regards this last point, we can only assume you must encourage your guests to eat quickly, before the candles burn down. Or hope for a lull in conversation while they burn at eye level. Time was when party games were restricted to the teen-age group but grown-ups are rediscovering them as a sure fire method to keep a party going. In the following group you should find enough ammunition to pep up even the dullest affairs. 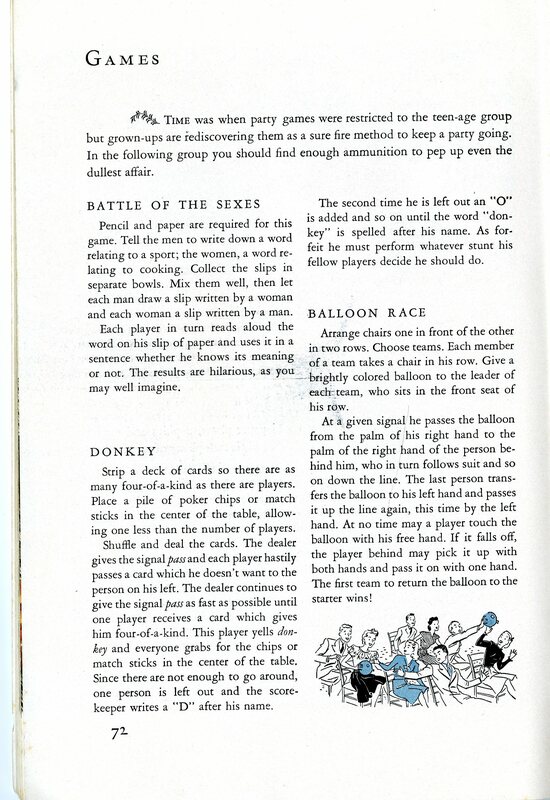 I’m not sure what kinds of the games the teen-agers were playing in 1946, but watch out for these grown ups! Card games, musical chairs (with music played on the piano–non piano owners, this may not be the game for you! ), scavenger hunts, celebrity quizzes and more! The post this week is a little indulgence in social history. While our party games may not be the same and our table decorations a little less creepy, the spirit is the same: A few guests and some good food can make for a pleasant evening. And if you’re lucky, those guests will be sure to compliment your exquisite taste in tableware and linens or your choice of games. Besides, even a game of “Know Yourself” is all in good fun…right?